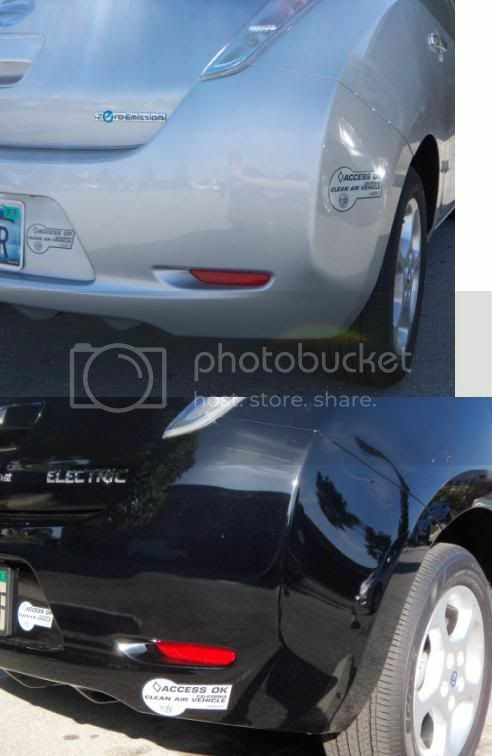 I put the small HOV sticker right next to the license plate (on the right side), with the CA EV-sticker on the left side of the license plate. I have not decided upon the placement of the two big HOV stickers. I tried to stick'em right where the DMV requested. I followed the advice of a former Prius owner who lost their stickers when the car was rear-ended and the bumper was replaced. Therefore, I avoided the lower wrap-around bumper on the Leaf; the side stickers are on the quarter-panels above the bodywork joint, and the rear sticker is on the lower right corner of the hatchback, 'inside' the "Zero Emission" letters. The idea is that if the Leaf is rear-ended, and the only damage is to the wrap-around bumper, replacing that won't require me to obtain replacement stickers (and forego HOV access while waiting for them). I think Hill did it right. Looks good. I wish CA DMV would just create a visually unique license plate for BEV's instead of plastering them with stickers. This would also help prevent ticketing confusion at charging stations. There are random EV conversions lurking about after all. EricH wrote: I followed the advice of a former Prius owner who lost their stickers when the car was rear-ended and the bumper was replaced. 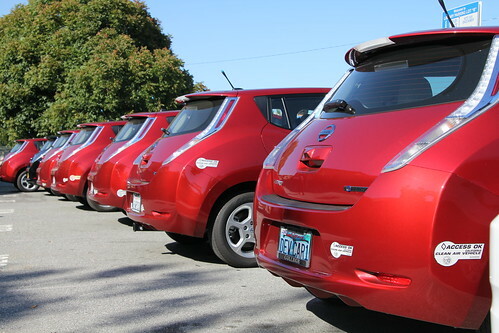 Therefore, I avoided the lower wrap-around bumper on the Leaf; the side stickers are on the quarter-panels above the bodywork joint, and the rear sticker is on the lower right corner of the hatchback, 'inside' the "Zero Emission" letters. Our Civic GX was lightly rear-ended and we had a concern about having to deal with getting replacement stickers. Luckily the damage was so minimal it only required refinishing/repainting the bumper in one area so the body shop was able to preserve the stickers. That said, if you are in a more major accident and the bumper is damaged then I'd go ahead and file for the replacement stickers right away. Odds are you'll get the new stickers not long after you get the car back from being repaired. Personally I intend to apply the stickers as low and out of sight on the car as possible because their shape is not complimentary to the Leaf's shape. They don't look terrible on the Civic as it is very angular - the Leaf is much more of a fluid design though and I think the stickers clash. +1 for specialized EV plates! I considered avoiding the wrap around bumper for the side stickers but I couldn't find a location that met the requirement for behind the wheel well and my aesthetics so I went ahead stuck to the bumper. I want my stickers to be approximately flat. I used masking tape to give myself guidelines and to test/preview the general placement. When our Prius was hit the body shop salvaged the stickers on the bumper so that is an option if the stickers are undamaged. In the future if the car does need to go to a body shop *and* it requires replacement stickers I would pull them off first thing and send away for replacements while the car was being repaired. I don't mean to rehash this, but is there any pre-application methods that make it easier to remove down the road (when they are no longer valid)? Applying something to the paint beforehand perhaps?